With the winter season now upon us, that means time for family gatherings for the Holidays. My family loves to get together during the winter holidays and when we do, we have so much fun. This year we are having the Halloween party at my house. So that means I have to do some deep cleaning to make sure our house is all ready for some fun. With me being a mom, I prefer to clean my house with green products. 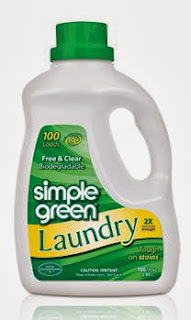 I was pleased to have the chance to work with Simple Green and they were kind enough to send me two different products one being the All Purple Cleaner Free & Clear and also the Laundry Detergent. Both which have been great. Simple Green offers non toxic safe products for your entire house from laundry, carpet cleaner, all purpose cleaner, pet products and so much more. There are even products for the outside that can clean your car, drive way and even your grill. Now that Fall has arrived I have been busy switching out our summer clothes for our winter clothes. However, when you switch out your clothes you have to wash the ones that have been stored away for months. Since, I had the chance to review the Simple Green Detergent I knew this would be the best time to really test the product. I really like that the Simple Green Laundry is safe on all washable fabric and is effective in HE and standard washing machines. Another great thing is that one bottle can wash up to 100 HE loads or 66 standard loads and offers powerful cleaning in cold or hot water. Since I have a HE washer, I will be able to use the same bottle for some time, which saves tons of money with the price only being $10.99. The detergent is also tough on dirt, grease, grass, food, coffee and wine. During the washing, I noticed that the detergent cleaned the clothes very well and left the colors bright. I love how a little goes a long way and how much money you can save by using the detergent. With my whole family using this product I have the ease of mind knowing my kids are wearing clothes that have been washed in a non-toxic detergent. The Simple Green Simple Green Ready-To-Use All-Purpose Cleaner Free & Clear is one of my new favorite items to use to clean the house. I love that the product is a safer alternative to toxic cleaners and solvents. It is free of scent and dyes for those with allergies and sensitivities. This product is pre-diluted with water to make your life easier, but the formula is still strong enough for heavy cleaning and will clean any area with ease. During my cleaning of the house getting it ready for our Halloween party I have cleaned several different areas and surfaces and it has done a great job. I have cleaned the trashcans, certain areas on the floor that a swiffer simply does not reach that good, walls and so much more. I was amazed at well the product worked at cleaning these areas. The products light scent is perfect for anyone with allergies, kids and babies. Now that my house is deep cleaned, it is time for some fun with a Halloween Party. Where to purchase: You are able to make a purchase from the Simple Green website. You can also click on the where to buy tab to find a store near you that sells Simple Green products. I like the Simple Green All-Purpose Wipes. I like the Simple Green Naturals Bathroom Cleaner. I love the Lemon Scent All Purpose Household Cleaner! Would love to try a few products they have but first I'd like Simple Green d Pro 3. I like the Naturals Glass and Surface Cleaner.